It was a mixed month for the world equity markets, with net monthly changes ranging from +18.5% (China), +0.4% (USA - Dow), to -4.3% (Germany - DAX). 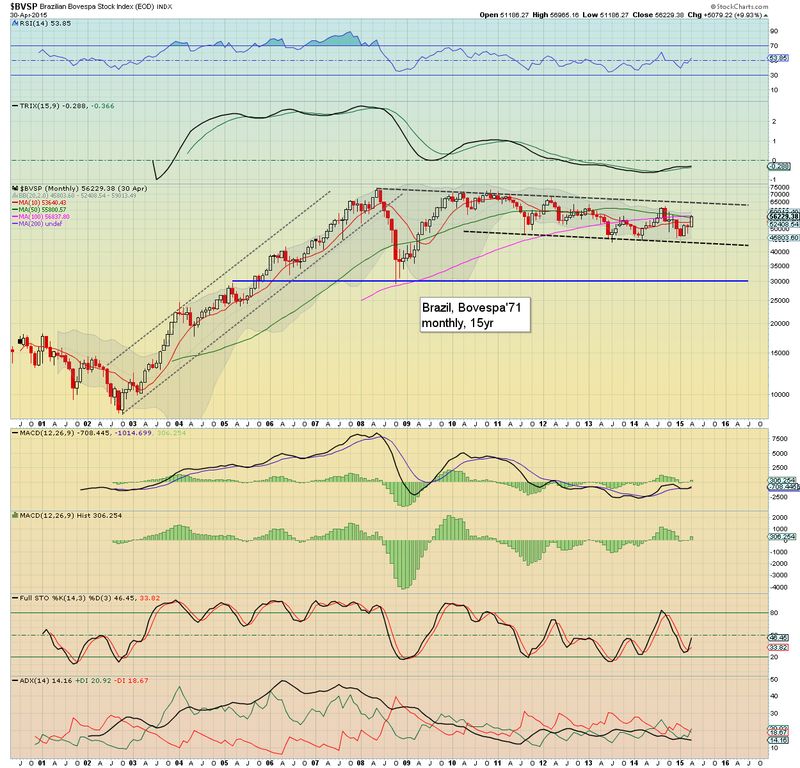 With low rates and continuing QE from a number of central banks, the broader trend for world equities remains bullish. Greece remains on the edge of both an outright debt default, and of leaving the Euro - the infamous GREXIT. Despite the near certainty of these two major events, the timing remains uncertain, not least as the latest Greek leadership seem more than happy to play the game of 'kick the can'. I remain open to a 'Sunday night surprise' at any point, where upon the Greek govt' surprise the capital markets will an abrupt exit from the Euro, along with at least some significant degree of debt default. Whether that occurs this month, in June.. or not for another year or two.. that is what is simply impossible to guess. In terms of price, the Athex is offering a spike floor of 691, having seen a net monthly gain of 6.1%. First upside target are the 1300s.. after that... 1700s. 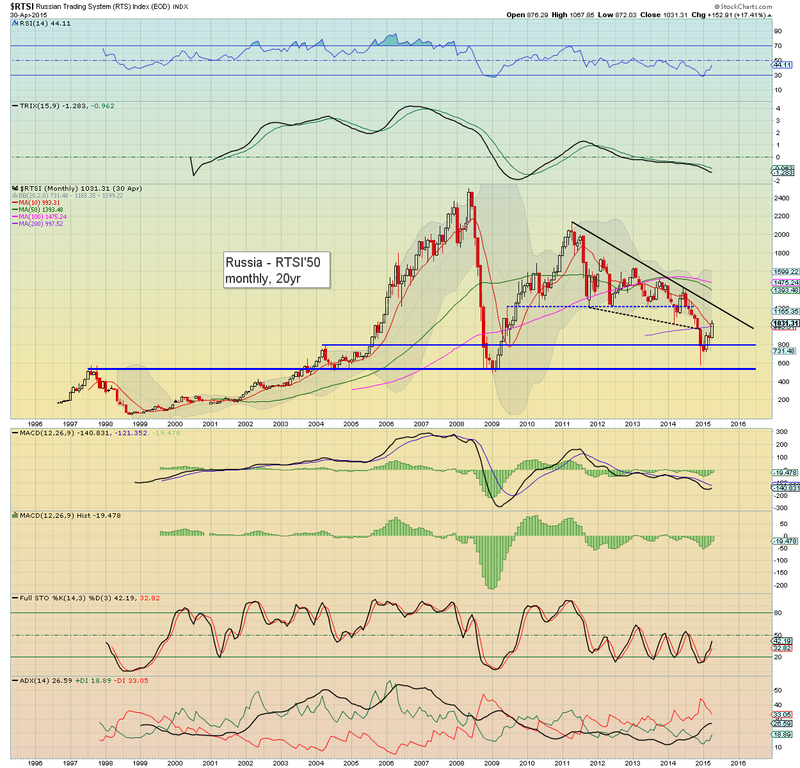 Clearly though, any GREXIT would be a major shock, and likely lead to another wave lower, although that would probably make for a key multi-decade low. With commodity prices offering a floor in the past few months, the Bovespa climbed a very powerful 9.9%. First key target is 65K, although that is clearly 2-3 months away.. even at the current rate of trend. 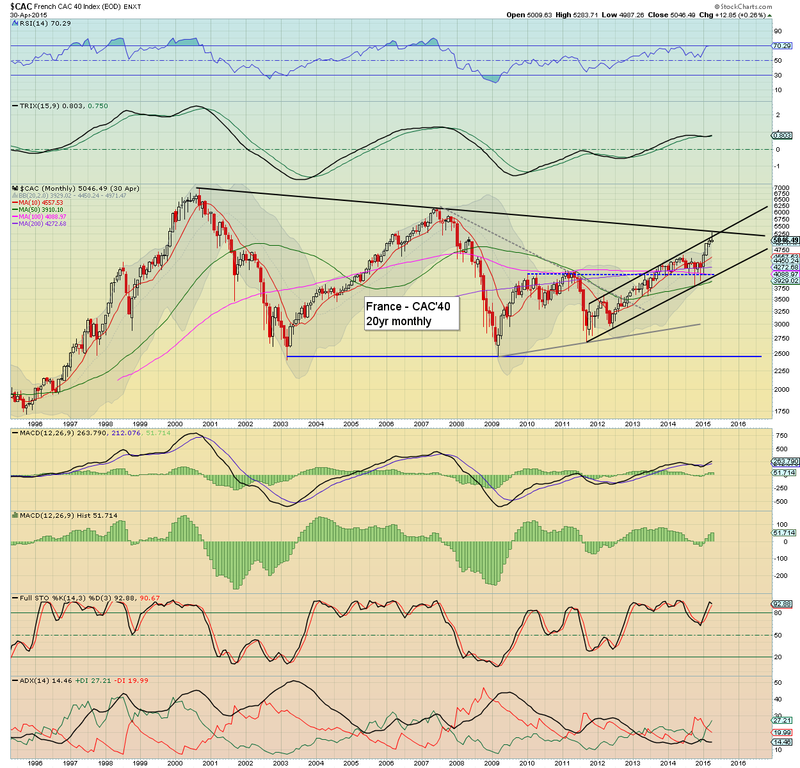 A monthly close >65K will offer a challenge of the May'2008 high of 73920. Outlook is bullish. The CAC hit a new multi-year high of 5283, but cooled into end month, with a fractional gain of 0.3%. Clearly, there is strong resistance in the 5250/500 zone. 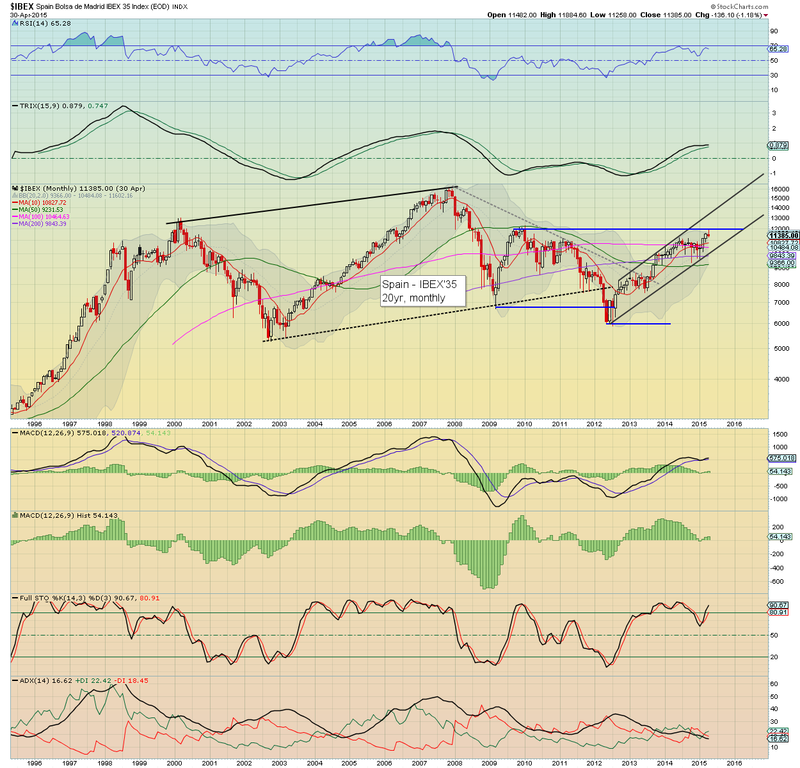 Trend remains very bullish though, and the June 2007 high of 6168 looks set to be challenged before year end. The economic powerhouse of the EU - Germany, saw a sig' net monthly decline of -4.3%, having broken another new historic high of 12390. DAX is clearly now scraping along the upper trend/resistance. The 13000s do not look viable until the very end of the year. In terms of downside, the giant 10K threshold looks set to hold this year.. and probably for many years. With an election next week (May 7th), the UK market saw a net monthly gain of 2.8%.. having hit a new historic high of 7122. 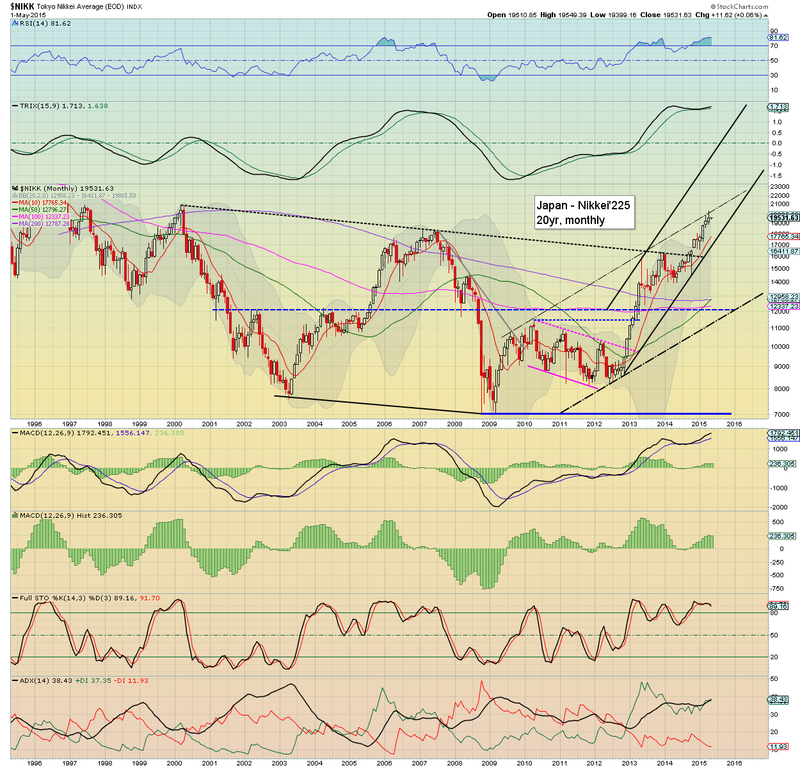 There looks to be end year upside to around 7800/8000. Key support in the summer will be around 6500. The ugliest of the EU PIIGS - Spain, saw an April decline of -1.2%, having got stuck just under the key 12k threshold. 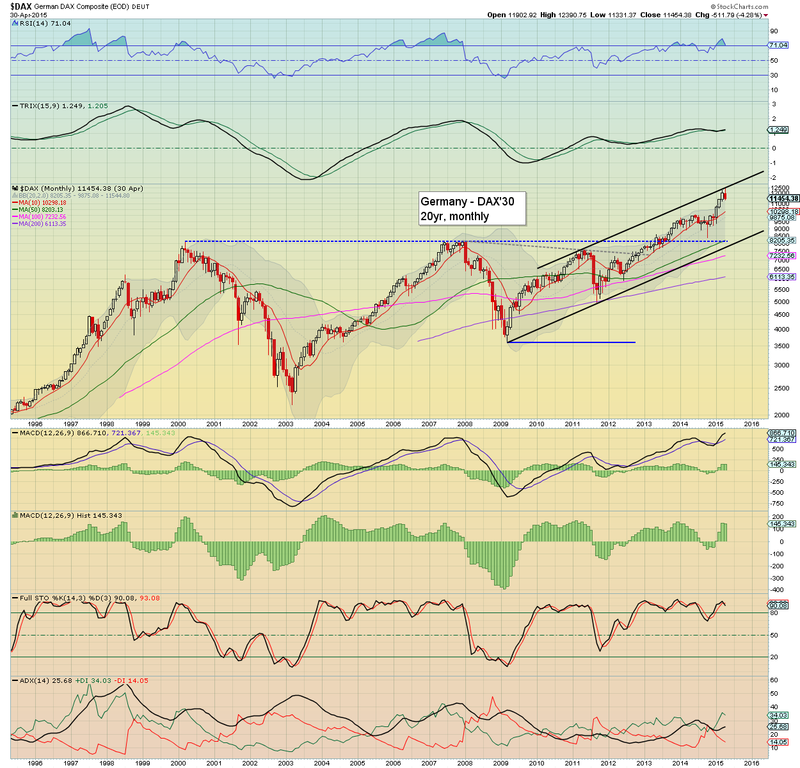 Considering the continuing QE from the ECB, the IBEX looks set to achieve a monthly close in the 12000s, opening the door to a yearly close around 15K. The US equity markets continue to see a great deal of chop, settling April with a gain of just 0.4%. Core support remains rising trend @ 17K. First key upside target is the 18400/600 zone. 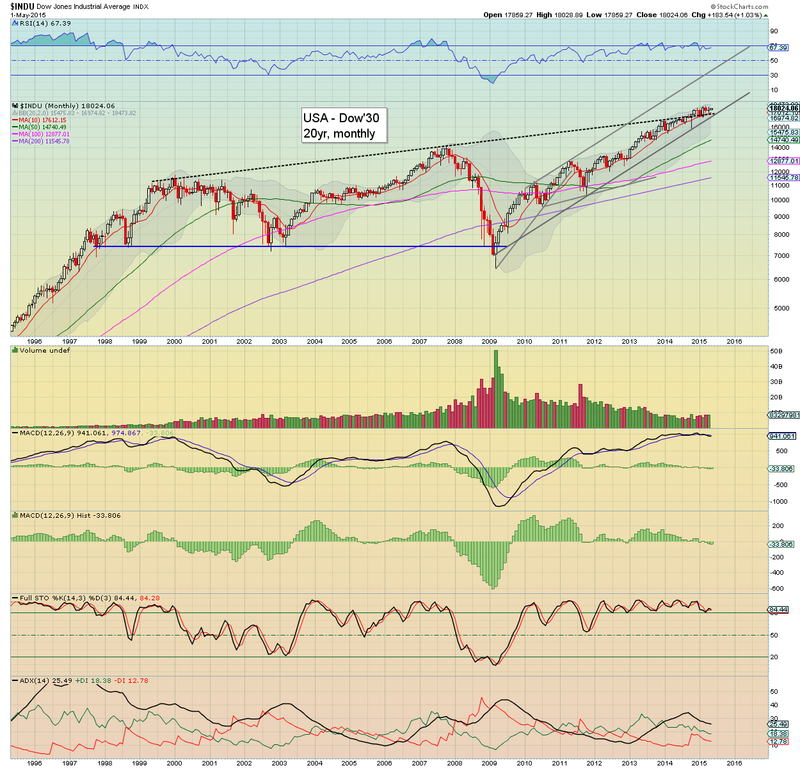 A monthly close in the 18700s would bode powerfully for the rest of the year. The BoJ fuelled Nikkei climbed higher for the fourth consecutive month, with a net gain of 1.6%, with a new multi-decade high of 20252. With the printing set to continue until the Yen implodes to near zero, the Nikkei looks set to keep on climbing for another two years. 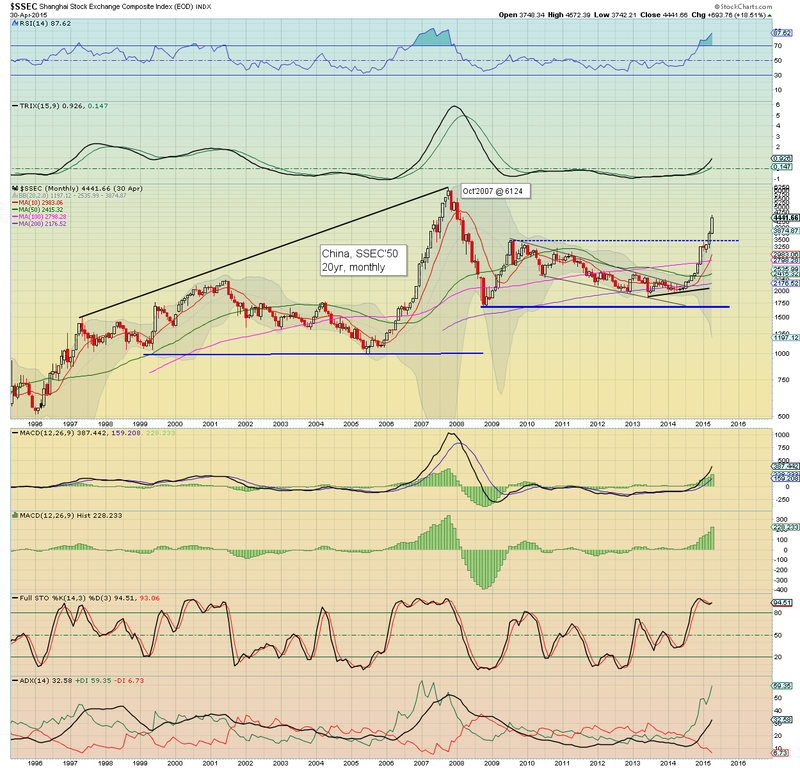 There are already a few in the mainstream who are starting to talk about a challenge of the all time high of 38957 - Dec' 1989. For me.. that is now the obvious hyper target in 2017, along with a depreciation in the Yen of around 50% from current levels. With Oil prices seeing extremely strong gains in April of around 25%, the heavily energy-price dependent Russian market soared, with a net monthly gain of 17.4%, back above the giant 1000 threshold. Next upside target is declining trend/resistance around 1200, but that is another 17% higher! China continues to hyper-ramp, with a net April gain of 18.5%, hitting a seven year high of 4572. Next key target is the giant 5K psy' level. A sig' pull back of at least 10% is viable at any time. Ultimate support is now the breakout zone of the 3400s. It was a pretty mixed month for world equities - with significant weakness in Germany (arguably due to concerns about a rallying Euro), but overall... there remains underlying strength across most equity markets. With low interest rates and continued QE (not least from the ECB and BoJ), there is ever more money in the world financial system, and this money is desperately trying to find a place to reside. Right now.. equities are the only viable place for income/growth... and most world markets look set to climb for another two years. At present, there is viable downside in the US and most world markets of 10%, but not much more than that. 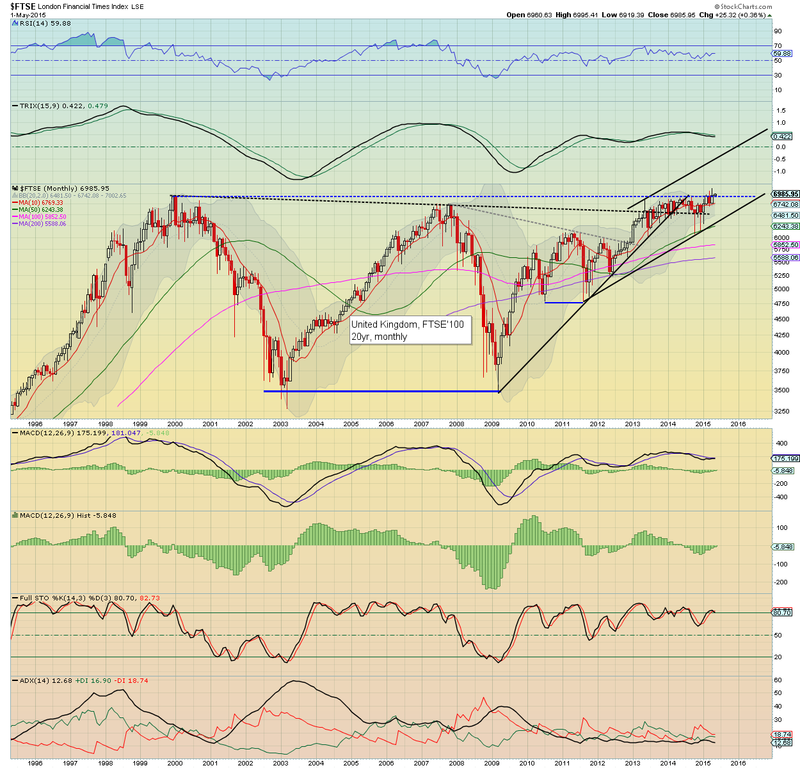 Of course, if for instance the US sp'500 could climb to 2200/300, viable downside would expand to 15%. A brief washout in the summer/autumn remains a key threat, but on any reasonable outlook, it appears to be the case that this giant QE/paper bubble is going to broadly continue all the way into 2017. With most of the corporate Q1 earnings out of the way, the market will be increasingly looking ahead into the coming summer. Most (myself included) are now resigned to the first opportunity for a rate rise no sooner than the FOMC of Sept'17th (which will be a Thursday). F - monthly jobs, wholesale trade. *there are a number of fed officials on the loose next week. Notably, the Yellen will be talking early Wednesday. Bears... beware! Despite a net Friday gain of 0.6% to DXY 95.28, the mid term trend in the USD remains bearish. The primary downside target of 93/92 looks easily viable in May... with the secondary zone of 90/89s more likely in mid/late June. 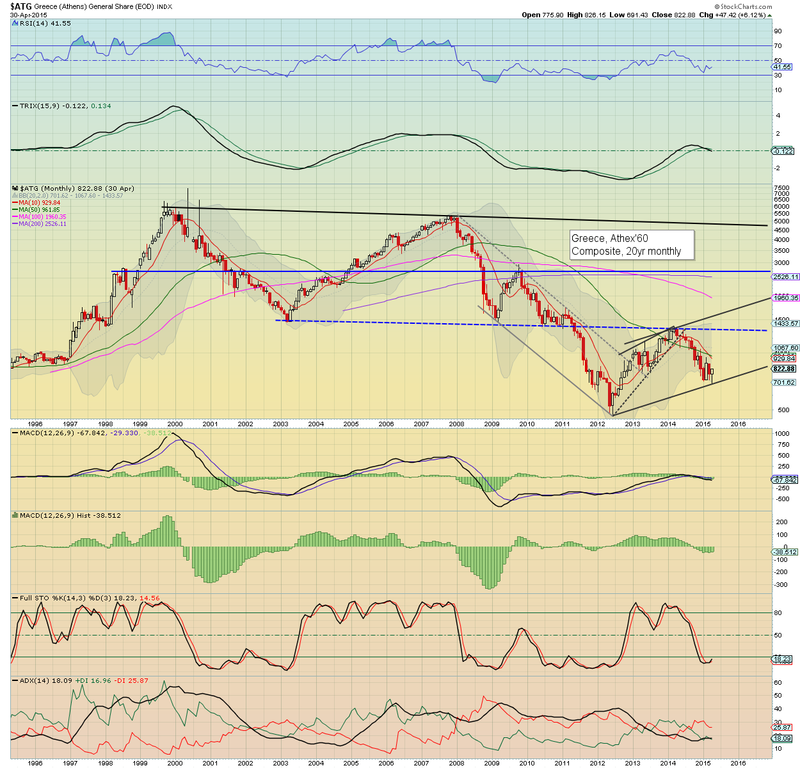 *a notable second blue candle on the giant monthly cycle... again, highly suggestive of a mid term top of DXY 100.71. On reflection, the USD could take many months... perhaps even the rest of this year to cool, before the next multi-month up cycle. 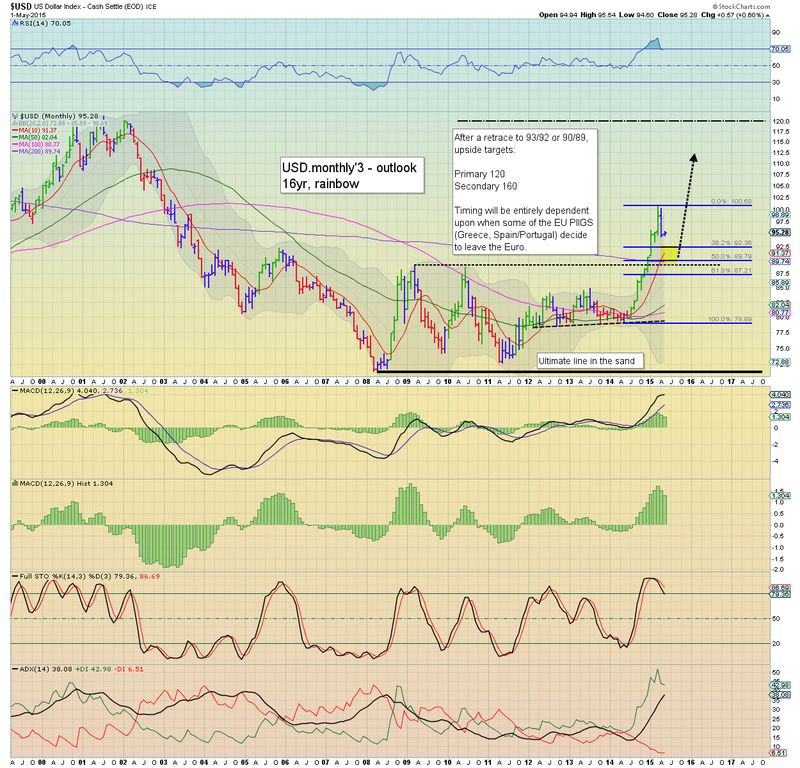 However, right now, my best guess is the USD will see a key floor in June/July... before resuming higher to the 120s. 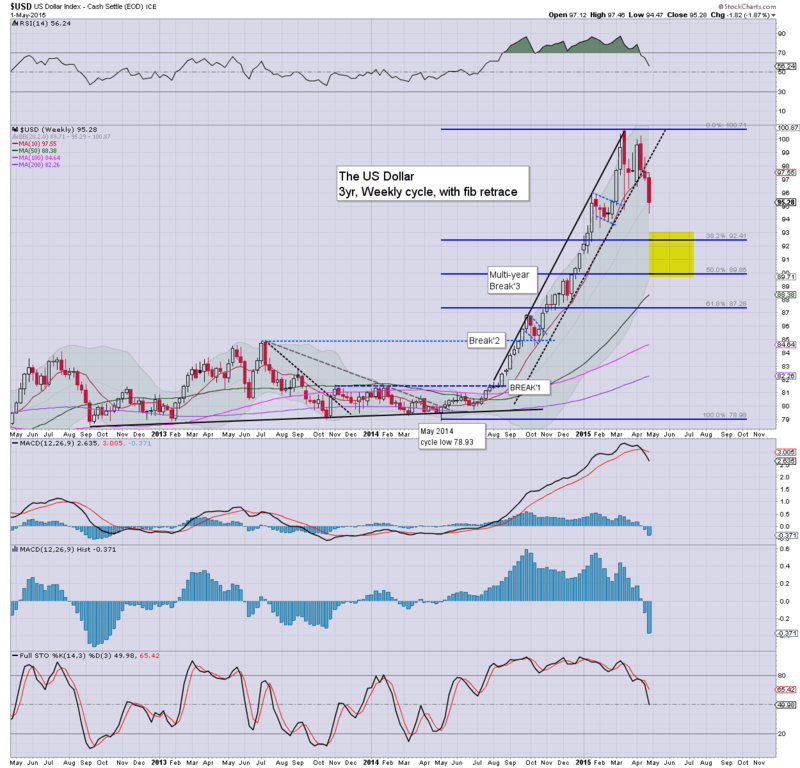 As ever.. a stronger USD will put downward pressure on most asset classes, but especially the precious metals and Oil. US equities closed significantly higher, sp +22pts @ 2108. The two leaders - Trans/R2K, settled higher by 1.7% and 0.7% respectively. Near term outlook still offers weakness next Mon/Tuesday, but the broader trend looks bullish.. at least into June. 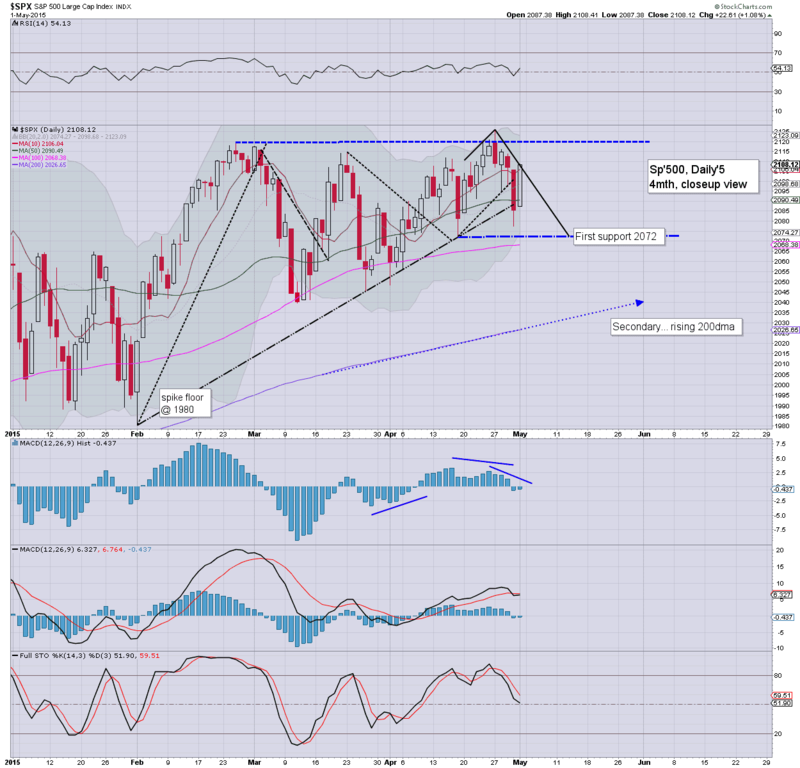 *despite the sig' net daily gains.. the two leaders - Trans/R2K, have seen rather important technical breaks this week. Broadly though... it continues to be a US market that has seen chop since last December. 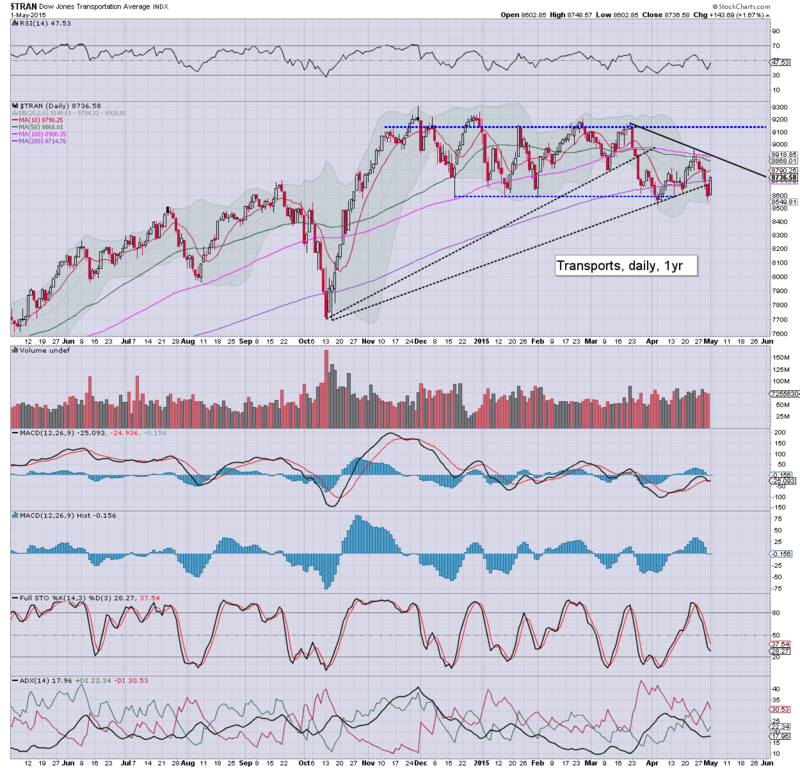 Equity bulls should be seeking a weekly close for the Transports in the 9300s. Until that is achieved.. there remains some justification for moderate concern. 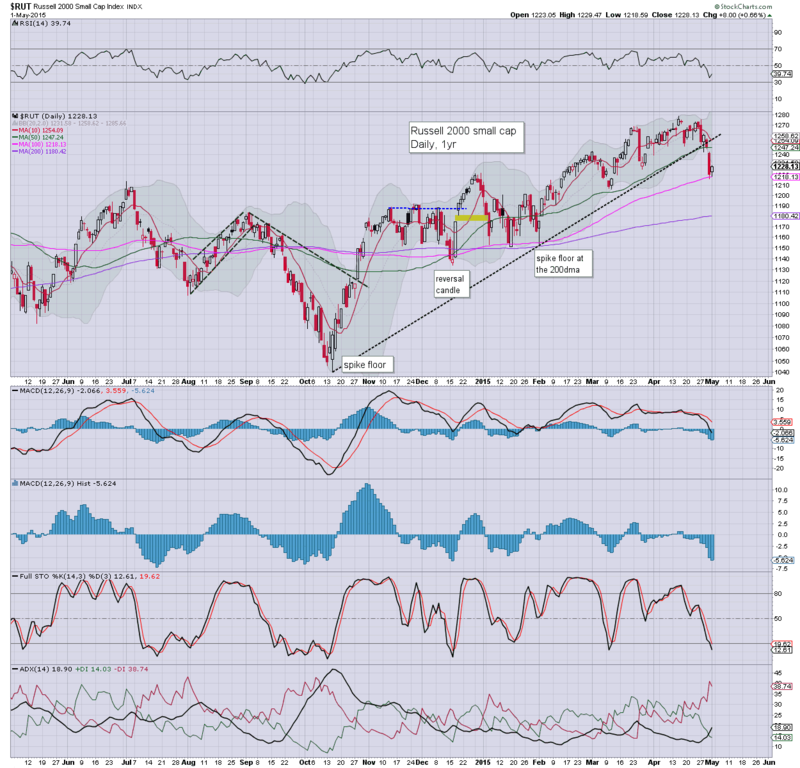 Ultimate support remains the 200dma of sp'2025... along with the giant 2K threshold.